West Ham have "100% faith" in manager Slaven Bilic, despite continued speculation about his future. 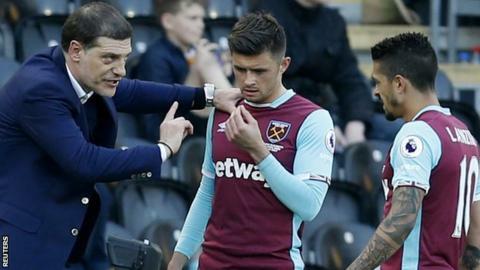 The Hammers were beaten 2-1 at Hull on Saturday, their fourth successive Premier League defeat - and have won only one of their past eight matches. The loss left them 14th in the table, six points above the Tigers, who occupy the final relegation place. "Despite speculation to the contrary, the manager's position is not under threat," said West Ham in a statement. The Hammers' last victory came at Southampton on 4 February and they have won only three times this year. The club added that Bilic had the "full backing the the playing squad" and the "overwhelming majority of supporters". They also urged fans to "unite behind the manager, his staff and the squad as we go into some important games". The 48-year-old Croat, a former West Ham and Everton defender, replaced Sam Allardyce at the London club in June 2015. The ex-Croatia international guided them to seventh and a place in the Europa League in their final season at Upton Park before the move to the former Olympic Stadium, but the Hammers have lost 15 of their first 30 league games this term. Q&A: What's in West Ham's stadium deal?